The University of South Carolina Women’s Basketball plays in the Sweet Sixteen this Friday, but it is not the only UofSC team currently in the running for a national championship. 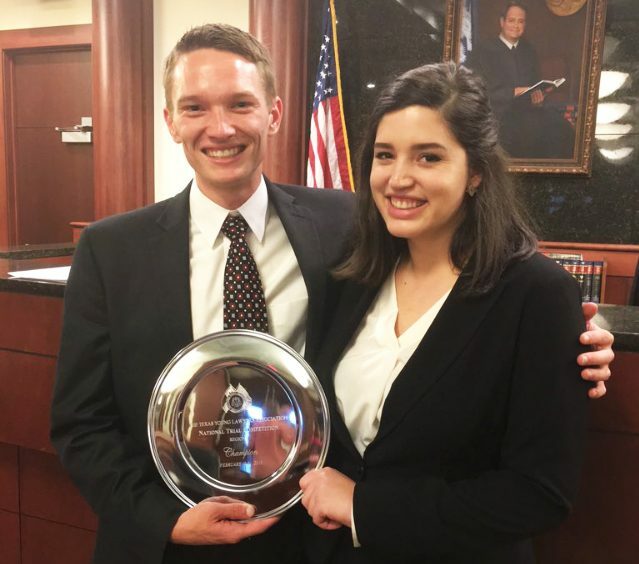 On March 30, the USC School of Law Mock Trial team will compete at the Texas Young Lawyers Association (TYLA) National Trial Competition in Dallas for the second year in a row. The team advanced to the national round after racking up yet another victory last month at the TYLA Regional Mock Trial. To make the win sweeter, USC also hosted the tournament for the first time. Second-year students Colin Spangler and Clair Hollingsworth celebrate their victory at the 2016 TYLA regional competition. The competition took place at the Lexington County Courthouse with 20 teams from 11 different schools, including Emory, University of Georgia, Wake Forest, and University of North Carolina – Chapel Hill. The USC School of Law teams entered the final round of the regionals ranked 1 and 2, respectively. Colin Spangler and Clair Hollingsworth won every single ballot—17 total, which is a rare feat—then defeated Charleston Law to advance to the national tournament. In addition, Spangler won Best Overall Advocate. The second team, which included Alexa Kluska and LeAnna McMenamin, lost to Wake Forest University School of Law by only one ballot, but still finished as finalists. This victory marks the fourth competition win in 17 months, along with its second finish as finalist. The first came in the William Daniel Mock Trial Competition. Next week, the national competition will feature 28 law schools from around the country, including Harvard Law, Stanford Law School, and Yale Law School. Although the competition is steep, Bayne is confident in his team’s abilities and accomplishments. This entry was posted in Noteworthy on 23 March 2016 by Rob Schaller.